When snow falls in the Santa Cruz Mountains our beautiful redwoods turn a glimmering white. Although snowfall is not common, true white redwoods are very rare. These are albino redwoods, that is, they are unable to produce chlorophyll, and need a mother tree in order to survive. The albino tree and the mother tree share a root system and thus the albino obtains the nutrients it needs to grow. David Kuty, a docent at Henry Cowell Redwoods State Park has classified them based upon the color of their foliage. There are six variations including white, bright yellow, green and white, and yellow-green. Most albino redwoods are white. Green and white specimens are much rarer. 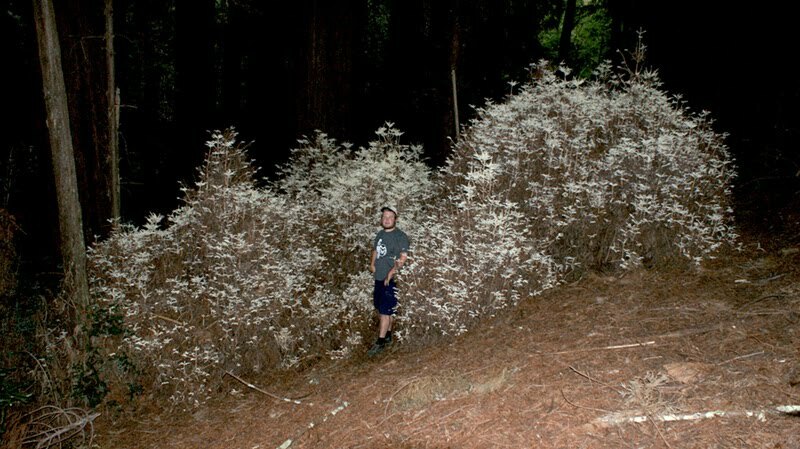 Botanist Zane Moore, pictured here next to an albino redwood hedge in the Santa Cruz Mountains, has studied and written about albino redwoods. Two such articles written by Zane appear in the Santa Cruz MAH publication Redwood Logging and Conservation in the Santa Cruz Mountains which is available in the San Lorenzo Valley Museum bookstore. The locations of these rare trees are not publicized in order to protect them; however an albino redwood can be seen on the Redwood Grove Loop Trail at Henry Cowell Redwoods State Park. Look out for it at stop number 14. 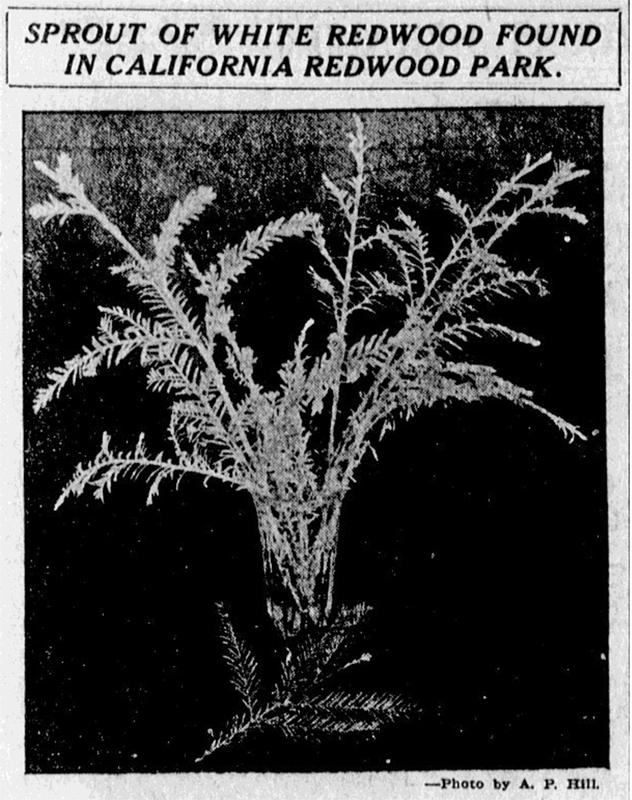 During the late 1800s and early 1900s, white redwood sprigs were used in ornamental floral arrangements especially for weddings and at Christmas. Indeed, the casual way in which the sprigs were referenced implies they were not considered too unusual. One such arrangement was described in 1882: “… then there were baskets of tea roses, interspersed with spays of fern, smilax and rare foliage plants, veiled, but not hidden, with the little fairy gypsaphilla, and these were sitting on beds of soft, green wood moss, bordered with flowers and white redwood in Grecian bric-a-brac …” In 1890, a white redwood from Paul Sweet gulch decorated the stage at Signor Enrico de Tomaso's testimonial held at Santa Cruz Opera House. In 1915, Andrew P. Hill photographed white redwood sprigs in Big Basin State Park, these photographs were published in the San Jose Mercury Herald. The article attests that “white redwood is rare and is only occasionally found where the second growth comes up after cut-over lands have been burned over.” While this may be a simplified statement, it does appear that stress may be a factor in the growth of white redwoods. In 1917, a beautiful specimen of white redwood was found between Boulder Creek and Felton. It was presented to the San Jose Chamber of Commerce. At Christmas 1928, Santa Cruzan Iva Davis and her relatives gathered white redwood at Skyland Ranch, just off Summit Road in the Santa Cruz Mountains. You can find out more about these amazing mutations at www.chimeraredwoods.com. This is a reprint of an article printed in the Santa Cruz Mountain Bulletin in the November/December 2015 issue.